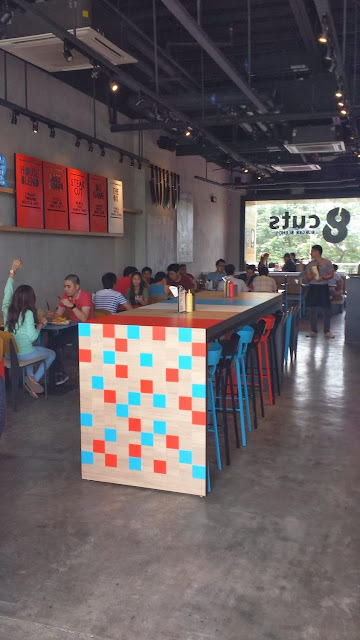 Are you familiar with Burger Bar and Cue Modern Barbecue? You probably love their food like I do! The same owners of the said establishments have opened a new food brand that you should try – it’s called 8cuts Burger Blends located at the second floor of the rather new foodie/shopping place known as the UP Town Center in Katipunan. One fine day, I went there with my friends LAg to check out the scene and try their food. 8cuts Burger Blends is brightly lit in the morning till afternoon thanks to the sunlight that naturally shines through the transparent window panes. The interiors are nothing fancy – on my right as I enter is the open kitchen that shows the on-the-spot preparation of orders as they come, and on my left are simple signs and symbols about the restaurant. The tables and chairs were mostly blue and orange, which are refreshing to the eyes. You may ask, “What makes 8cuts Burger Blends unique from other burger brands?” Well, their patties are made from either 100% pure US beef, fresh NZ lamb or the happiest mushrooms out there. Patties are custom-blended and hand-pressed daily without any artificial additives. 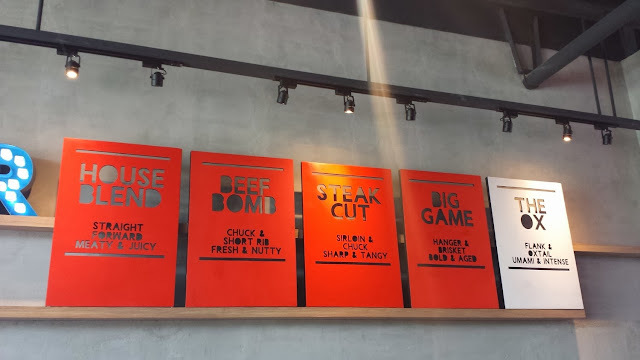 The restaurant’s name, 8cuts Burger Blends, signifies the eight different cuts of a cow, namely Chuck, Rib Eye, Short Rib, Sirloin, Brisket, Hanger, Flank and Ox Tail. It also boasts of the five different custom patty blends such as House Blend, Beef Bomb, Steak Cut, Big Game, and Ox Blend. We ordered a Boss Burger, which gave us the freedom to choose the type of bun, meat, sauce, and add-ons. 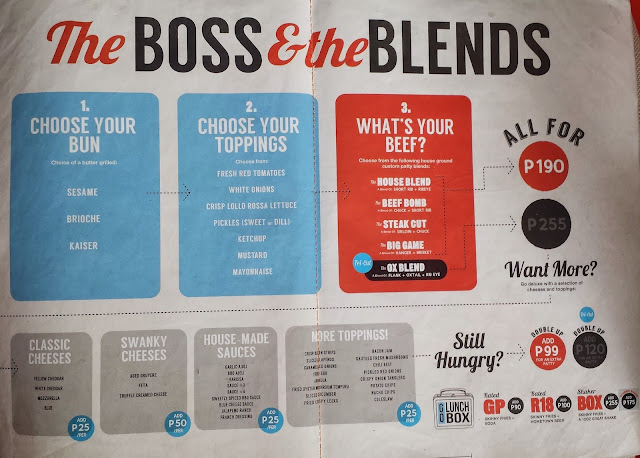 Depending on the beef you choose, a burger will cost either Php190 or Php255. You can add cheeses, sauces, and other toppings for Php25 to Php50 each. There’s also an upgrade option to Go Lunch Box, which allows you to add Skinny Fries and Beer/Soda/Classic Shake for an additional Php90 to Php255. 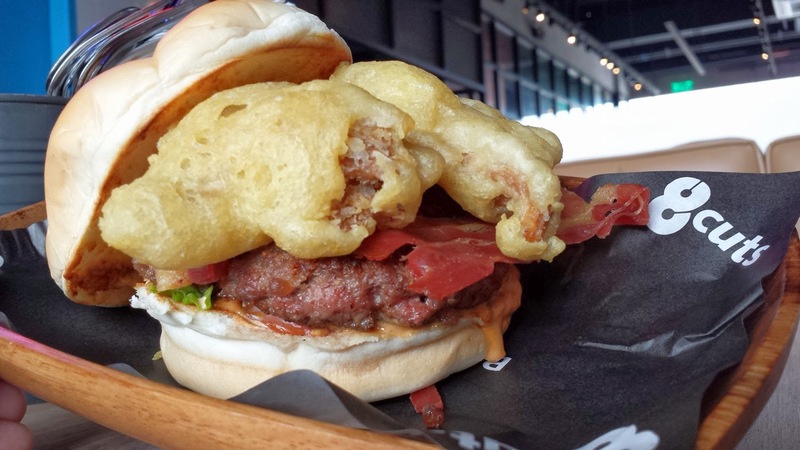 For us, we got the Kaiser Bun (flower design) with Ox Blend (Flank and Ox Tail), added fresh red tomatoes, ketchup, and mayonnaise, barbecue aioli, crisp bacon strips and fried oyster mushroom tempura – a total of Php330. From the first bite, we already knew that it was made from genuine beef. It was very tasty and juicy. In addition, the combination of the sauces we chose tasted great! I find the oyster tempura tasteless though, so the burger could’ve been a bit cheaper without it. If customization is not your thing, 8cuts Burger Blends also has Classic and Tribute Burgers, which offers a wide variety of burger choices. Like the Boss Burger, it can also be upgraded to Go Lunch Box. You may also opt to get double patty, which comes with a minimal fee. We ordered the Four Cheese burger (Php245). It’s a parmesan-crusted quarter-pounder with Beef Bomb (Chuck and Short Rib) patty, yellow cheddar, aged gruyere, mozzarella, arugula, and garlic aioli on a Sesame Seed Bun. I liked how this burger tasted. The blend of chuck and short rib beef was awesome – not dry, very chewy, no fats. 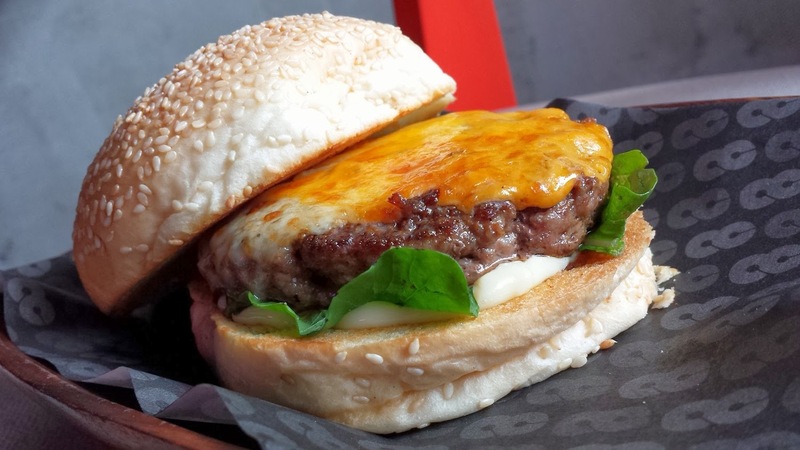 The mix of cheese on top of the patty gave the burger a hint of saltiness, but not too much. 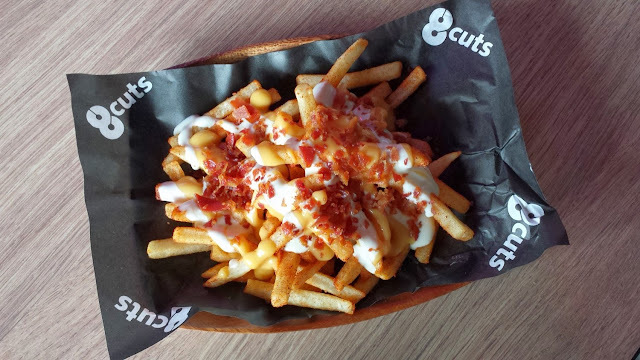 Their Skinny Fries (Php45) can also be customized with toppings and sauces. For us, we added Sub-atomic Bacon and Cheese for Php70 and ordered a separate barbecue jalapeno & mozzarella for Php90. There’s nothing spectacular about it, but it was okay. 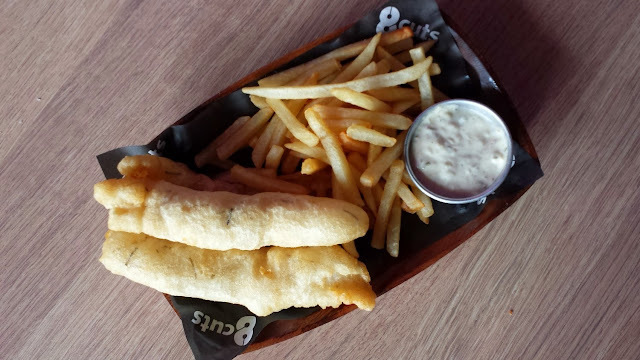 Draft Beer Battered Fish & Chips (Php190) came in three big pieces with a good portion of fries. We could taste the beer flavor of the fish, which was complemented by the green lemon mayo dip. It can be improve though, since the fish can taste a bit bland without the dip. The Golden Cheddar Mozzarella Sticks (Php225) with five pieces of sticks filled with yellow cheddar and mozzarella cheeses are best eaten with the marinara sauce. Eat it while it’s hot! 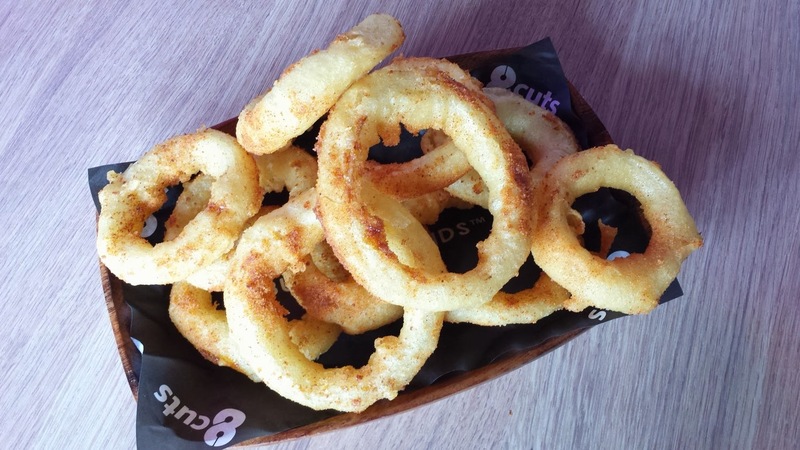 We super love the Onion Rings (Php65), which was topped with barbecue flavor. As compared to others that had small onion wrapped on huge batter, 8cuts’ version was the opposite. It really tasted very good as it is, the garlic aioli dip that came with it also have it a different twist. 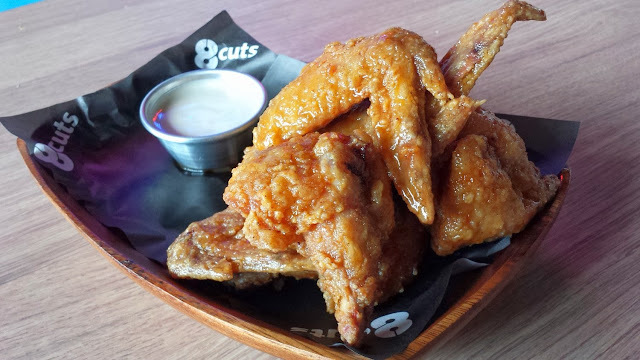 Another big hit for us was the Good ‘ol Hot Fried Wings (Php285) that came with 8-glazed pieces of chicken wings. Unlike others, the great taste doesn’t end in the skin, but also in the meat itself. 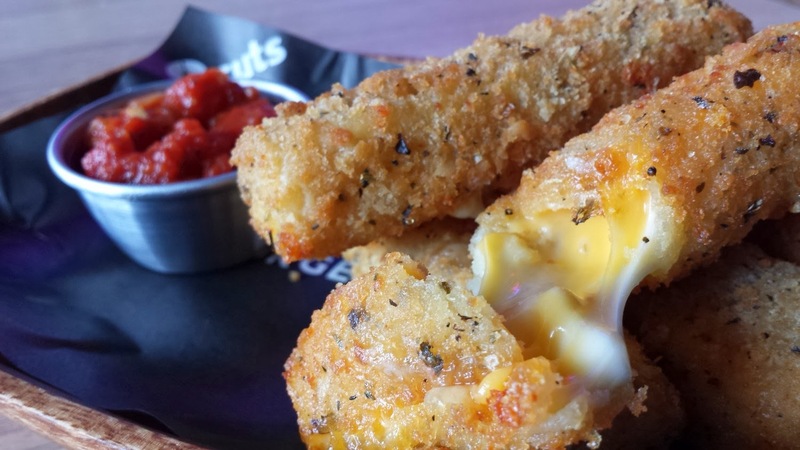 You don’t have to worry, because it isn’t too spicy that will make you sweat. Matched with the ranch sauce, the taste is perfect! Our favorite! For drinks, we got a Salted Caramel Classic Shake (Php150 for 120oz. and Php180 for 16oz. ), a combination of Nutella and Speculoos Cookie Butter called Nutelloos Leveled-up Shake (Php220 for 120oz. and Php295 for 16oz. 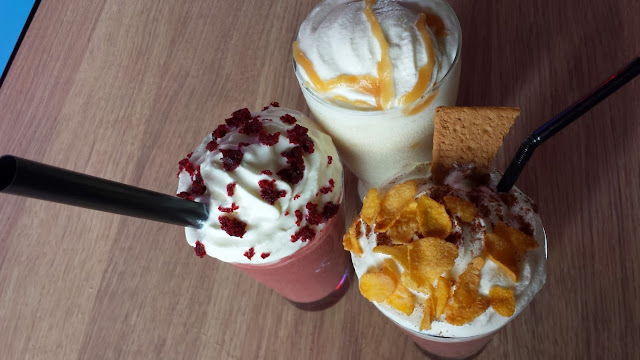 ), and a Red Velvet Caked Shake (Php220 for 120oz. and Php295 for 16oz.). We found the shakes really delicious and creamy, but not too sweet - just perfect! Finally, we had the Molten Chocolate Bottoms (Php135) and the Blueberry Cheesecake (Php135) for dessert. It came in a jar with moist hot chocolate cake, chocolate bits, ice cream, whipped cream, crushed cookies, cheesecake, and syrups. 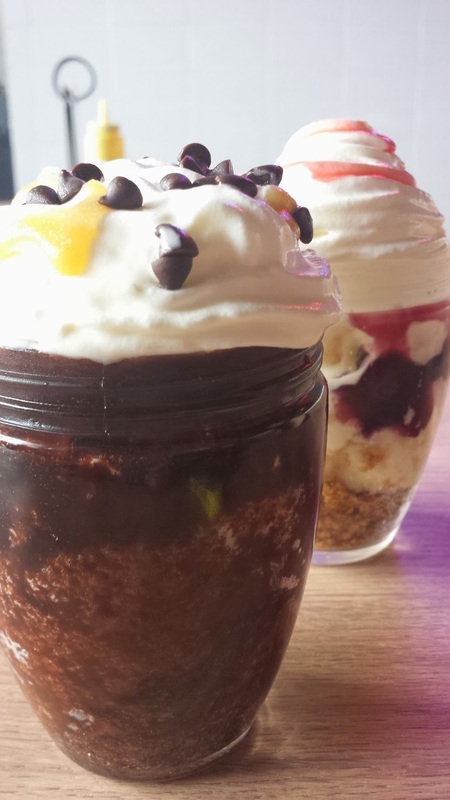 These desserts were a great cap after a filling lunch of burgers, fries, and wings. 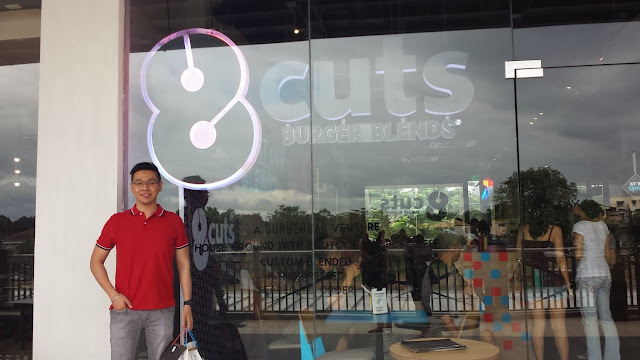 If burgers are your thing, I highly recommend you try 8cuts Burger Blends at the UP Town Center in Katipunan. You can easily see it from the parking lot beside it. 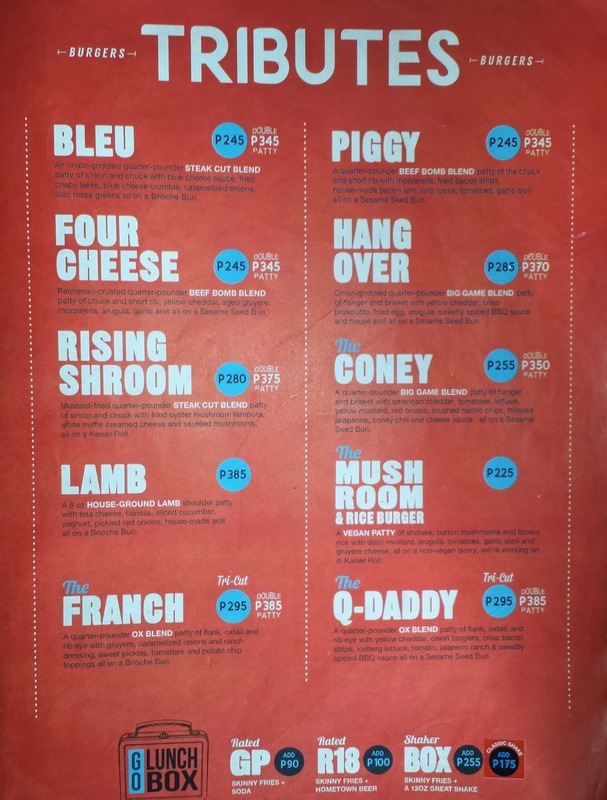 Each meal may cost an average of Php300 per person. Images were taken by my friend AGC.